Listen in as Ann describes how she developed a family run internet marketing business that spans the globe! You’ll hear how Ann powerfully leads not only her 80/20 Marketing Team, but also her company’s members and 350,000 subscriber base. “People don’t want just information,” Ann says. “They want a unique experience that helps them reach their goals.” Ann is also keen on fostering an interactive community culture that allows for talent and leadership to develop naturally. Ann is the author of some of the most widely read books in the world on how to get new customers and prospective clients coming to you. She is considered one of the pioneers of attraction marketing. Like most people starting out, Ann spent many frustrating years recruiting friends and family, attending meetings, and calling “opportunity leads” in an effort to grow her business. After going into debt and watching her husband lose his income, she knew she had to try something different. Using unconventional, yet powerful online methods, Ann discovered how to attract prospects to her and was able to become the #1 international producer in her company in just 6 short months. Her business quickly grew to $90,000 a month, and she went on to earn her first million within 2 years. Since then Ann has been able to dramatically impact the lives of tens of thousands of people, from CEOs to beginning entrepreneurs, through her groundbreaking coaching and training programs. Her reports have been read by over 350,000 people worldwide, many of whom have gone on to achieve 6- and even 7-figure incomes. Ann’s free training alone is highly valued by aspiring, emerging, and experienced business owners and may be accessed via The Renegade Blog. Ann has been featured on and in numerous radio programs, media outlets, books, and other publications. Passionate about educating and teaching entrepreneurs, she’s developed a unique ability for helping beginners overcome the obstacles that are holding them back. Ann’s training has created an unparalleled number of internet success stories and has helped thousands of business owners generate their first customers and clients online. You can access three of her books by clicking on the images below. My belief is that we have a duty to find our God given calling and to fulfill it. Always, without exception, it will be to better other people’s lives. Listen to the interview with Ann by clicking the link below. Ann, people will be blown away by your candor, vision, and courage. What a role model and change agent you are! I’m honored to be connected to a woman of so much vision, faith, and integrity. May the Lord grant you a long life of influence and contribution! Proud to be associated with you. 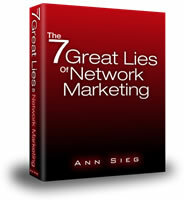 Would Like to attend a conference with Ann Sieg this February 2013.Can you kindly email me information. Happy to see what we can do, Michelle. The tickets are sold out, but we may be able to wprl something out. One of my team members isn’t able to make it after all. I’ll email you now. Thanks for your interest.